*Question: "How do I transition to veganism slowly?" *Question: "Can I perform as a vegan athlete?" When we got home from visiting family out of town for Thanksgiving, we had a pile of newspapers at our front door. I've slowly been reading them while loading clothes into the laundry and generally cleaning up from being gone. In our Nashville Tennesseean, the cover story was about how food prices have dipped since last year. That seems like a good thing, but what really disturbed me was this sentence, "The cost of a classic Thanksgiving dinner for 10 people has declined 4 percent to $42.91 this year compared to 2008, as a result of the overproduction of turkeys and weak worldwide demand for U.S. dairy products, according to the American Farm Bureau Federation." Now, any good vegan loves the words "weak demand for dairy products," but we also shudder at the words "...production of turkeys." Production?! Really? Are we talking about glue here? Or rubber? Or even Cheetos? That just goes to show you that factory farming is alive and well in the minds of the American Farm Bureau Federation, as well as the media. Animals are living beings who shouldn't be produced. Oddly enough, just a few hours before reading this story, I had been marveling over the intelligence of living, breathing poultry. Our dog watcher's neighbors had some fancy chickens walking around her lawn when we arrived to pick up the dogs. They followed our dog watcher from their own lawn to hers, trying to get her handfuls of dandelion greens. I leaned down and reached my hand out to them and they came trotting right up to me. They ate a few pieces of grass I held out to them and let me pet their incredibly soft feathers. Chicken feathers are softer than the tiny fur on the back of my dogs' ears. Who knew?! Then the owner started calling their names and the chickens turned around and ran back to her. How could anyone want to produce and eat creatures like that? The weird thing about that same Sunday newspaper (and really, public opinion) is that the lead story of the local section was about a Humane Society rescue of 84 starving horses, dogs, and goats from a local farm. Evidently the owner left them emaciated, with parasites and infected hooves. 1). There is a big discrepancy between animals that our society says it's okay to eat and those we ride and pet. The juxtaposition of two articles in one paper about "producing animals" and "saving animals" shows this easily. In the end, they're all living, sentient beings capable of being abused, tortured, and feeling emotions. Why pet one and eat the other? 2). We need to keep bringing awareness to the suffering of animals, so that in the future someone doesn't buy 80 horses he can't take care of and allow them to waste away. There's an excellent resource out there for those of you looking for updates on media attention about animals. Karen Dawn created Dawn Watch a few years ago, and I get email alerts whenever any media source talks about animal issues. I definitely recommend checking it out! Just by being involved and learning more about the food industry today, you are helping. Thank you for participating, and for reading my newsletter. We just need to keep spreading the message and making sure people know the truth. Once you know the truth, it's hard to turn your back on it. Spread the truth! In the pursuit of spreading the truth, a project I've been thinking about and working on for some time has come to fruition. My goal with running Vegan Nutritionista is to increase awareness of the compassion involved in deciding to forgo animal products in the pursuit of saving lives, reducing suffering of all living beings, and improving the environmental conditions around us. I wanted to help people decide to become vegan, transition to a plant-based diet, or simply give veteran vegans more tidbits of information to help them spread the message. I started Vegan Nutritionista simply with that goal, and as it's evolved, I've realized I can do more than simply writing articles on the website and sending out this newsletter. If you've been reading this newsletter for awhile, you know I introduced A Fresh New Vegan You as an ebook to help people transition to veganism, Vegan Meal Plans as a guide to a month's worth of vegan meals, and I often recommend products and spread recipes that I love. This newest project is a super fun one... tee shirts. I personally love the cute little vegan tees on the market, but I saw a hole in the marketplace for shirts with messages about the cute, witty things animals do and feel. ...pigs are more aware of their surroundings than dogs and 3 year-old children? 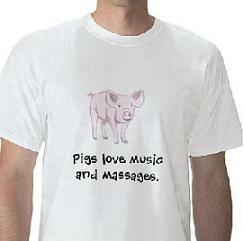 ...pigs love massages and music? ...cows mourn the loss of their friends, and sometimes cry real tears? ...baby chicks learn to peep from their mother... while they're still inside the egg? ...and so many more interesting, adorable facts about farm animals. Rather than focusing on the depressing messages about factory farms, I think positive shirts about animals will bring out the compassion in people around us. Put one of these tees on your Christmas list, and buy one for a friend. 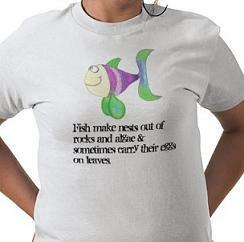 Fish make nests out of rocks and algae & sometimes carry their eggs on leaves. 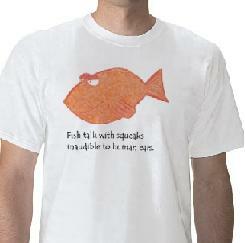 Fish talk with squeaks inaudible to human ears. Pigs love music and massages. Vegan Meal Plans is a complete meal plan for one month vegan weekday dinners. It includes recipes, pictures, nutritional information, grocery lists, and tips and techniques. Everyone from those beginning a vegan diet to those veterans who want fresh menu ideas love this ebook. It focuses on fresh, local, and seasonal vegetables and uses all normal ingredients-- no fussy or gourmet skills needed. Download a copy for only $9.75 here. This massive, complete vegan grocery list is the only one you'll ever need. Print out copies of it to hang on your fridge, and then mark what you need as you go throughout the week. Download a copy for only 99¢. "How Do I Transition to Veganism Slowly?" 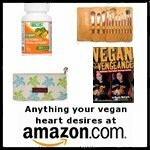 Question: I just purchased The Kind Diet by Alicia Silverstone because I'm thinking of going vegan. However, even the "Flirting" chapter appears to be extreme for me. How can I transition to veganism slowly? What is your opinion about this book? I enjoyed reading it. I have only flipped through The Kind Diet , but it looks awesome. I totally understand what you mean. I personally don't love the idea of defining everything so strictly. Even though it's a cool concept, it pigeon-holes people and makes it feel like a "diet" more than a lifestyle change. While some people are able to drop all meat or all dairy at once, others struggle with the confines of a diet like that. Read the rest of my answer here. "Can Athletes Perform at High Levels on a Vegan Diet?" Question: I have been a life long meat eater, and a more recent self proclaimed 'foodie' as I have been more exposed to great food. I grew up in a small town in the midwest and now live in L.A. and work in the restaurant industry. I am reading a book called The Face on Your Plate: The Truth About Food, a book I'm sure you've heard of. I feel extremely obligated to become a vegan. Red meat is easy for me to get rid of and even poultry. I love Almond Milk so that's a no brainer. I work in a sushi restaurant so that is where I begin to already feel myself suffering and I am finding it hard to imagine myself without every product containing casein or some form of milk. I am extremely into fitness, martial arts and lifting weights. I love to look muscular and I am concerned with keeping my shape. I know I will be healthier but are there some simple tips you could give me for getting the right combination of protein and carbohydrates for a very busy, active girl like myself? Also, what physical and mental transitions have been the most positive for you and your conversion to vegan? I appreciate your time and effort and look forward to hearing from you!!! Along the same lines as this question, I was recently honored to have been able to interview Rip Esselstyn, author of The Engine 2 Diet . He was a professional triathlete and is now a firefighter, and was motivated to write his first book after helping several fellow firemen lower their cholesterol, lose weight, gain energy, and take control of their lives. Rip is also the son of Dr. Caldwell Esselstyn, who wrote the book Prevent and Reverse Heart Disease and became a huge promoter of vegan diets many years before it was acceptable to do so. Both Esselstyns are paving the way to a healthier future. Check out the interview with Rip here. Have unresolved questions about veganism? Want to share some details and recipes from your vegan Thanksgiving? Join in the discussion on our site by asking and answering questions, as well as commenting on other answers. It's fun and helpful! I had so much fun putting together this little video for a great vegan banana bread recipe I made recently. I tried an experiment and used chia seed gel in place of oil, giving the bread no added fat. I know many people watch their oil intake, so this is a popular recipe staple. Learn all about the health benefits of chia seeds, how to use them in place of oil, and simply watch me make a quick, easy, and delicious vegan banana bread. Mmmmm! Watch the video and read the recipe here.